Don't count your chickens before they're hatched -- particularly if you have your eyes on a cabinet position. Taste the Arts: The Peterborough Arts Umbrella is pleased to present the seventh annual Taste the Arts fine dining fundraiser on Sunday, October 26 - 6:00 pm at the Rare Grill House (166 Brock Street). This year's theme is the 100 Mile Meal, featuring a gourmet, five-course meal created from ingredients found within a 100 mile radius of the city. This is a highly popular event and a wonderful opportunity to enjoy a delectable, creative meal while supporting Peterborough's only full-service arts organization, dedicated to serving artists in Peterborough and the Kawarthas since 1984. Proceeds from Taste the Arts support the Peterborough Arts Umbrella's annual programming costs. Tickets are $100.00 each. An optional wine package featuring specially selected pairings is available for an additional $25.00. Call Rare Grill House at (705) 742-3737 or the Peterborough Arts Umbrella at (705) 749-3220 to reserve a place. Doors open at 5:00 pm and dinner begins at 6:00 pm. A personal note: David Franklin was the chef who prepared the dinner for Grace United Church when Rev. Lyle Horn celebrated 25 years of ministry this past spring. It was amazing -- the event and the food. Dave's work can only be described as art on a plate. Here's a detail that still sticks in my head, many months after the fact: The salad bowls were fully edible. FarmFresh Foods, locally grown. Lists local markets, retailers, and restaurants that specialize in locally grown foods; as well as places where you can buy food straight off the farm. "I'm so disappointed in Peterborough. Now I remember why I ran away when I was 16." - A Peterborough voter commenting on the election results, quoted in today's Peterborough Examiner. I believe in Peterborough and its potential to become something more. This is what I think about when I think about Peterborough and its potential. Peterborough, the ethical city; Peterborough, the just city; Peterborough, the visionary city; Peterborough, the creative city; Peterborough, the innovative city; Peterborough, the eco-city; Peterborough, the multicultural city; Peterborough, the all-ages city; Peterborough, the hate-free city; Peterborough, the bullying-free city; Peterborough, the no-one-goes-hungry city; Peterborough, the barrier-free city; Peterborough, the entrepreneurial city; Peterborough, the healthy city; Peterborough, the active city; Peterborough, the sustainable city; Peterborough, the local foodbasket city; Peterborough, the welcoming city; Peterborough, the politically engaged city; Peterborough, the public spaces city; Peterborough, the indie media city, Peterborough, possibility city. A lot of people are working towards these various ends. And not all progress has to come through political channels. 2. Work for change through all channels available to you as a citizen. Don't give in to cynicism or apathy. Let frustration fuel your resolve to work for change. Some simple truths, as I see them, as Canadians prepare to head to the polls. We talk about how we want to feel safe and secure -- to have a government that makes sound economic decisions that take the needs of the ordinary citizen into account -- and that won't cause us to lose our bank account savings or our homes. Simple truth: We need a government with sound economic vision and a willingness to steer clear of the mistakes of the Bush administration. We talk about how important it is to us to stop destroying the planet so that our beautiful country will be able to provide the land and water that our children and grandchildren will need to grown and thrive. Simple truth: We need a government that is offering Canadian voters a fully-costed visionary plan on tackling the biggest issue of our generation. The Conservative Party of Canada is completely at odds with the kind of action Canadians want to see on the environment. Every other party understands the necessity of making the environment a priority issue. We talk about how industries that are doing the damage to the planet should be the ones to pay to clean it up. Simple truth: We need an environmental action plan that taxes what we burn, not what we earn. Read this article to find out why David Suzuki thinks a carbon tax is the way to go. We talk about how much our health care system matters to us -- and how important it is to us that every Canadian be able to have access to a family doctor and how chronically underserviced communities and provinces need to have their long-standing shortages in certain health specialties (for example children's mental health services; mental health services in general)? Simple truth: The progressive parties understand what Canadians mean when they say that our health care system is failing us. It's not all about wait times and better record-keeping. Nor is privatization the answer. We talk about how we want a government that protects the health and safety of Canadians. Government policy errors helped bring about this epidemic. Yet surprisingly, government has taken no remedial steps beyond issuing a food recall. Instead, officials praise the success of our infectious disease surveillance system — as if, with 16 dead [20 as of today], there were cause to celebrate — while food safety standards remain as low as ever. The listeriosis epidemic is a timely reminder that the Harper government has reversed much of the progress that previous governments made on governing for public health. ....And listeriosis may be the least of it. The same November 2007 Cabinet decision that handed self-inspection to the owners of meat plants did the same for operators of animal feed mills and cut back the avian influenza preparedness program. Yet bad animal feed led to the epidemic of bovinespongiform encephalitis (mad cow disease), and in an influenza pandemic tens of thousands of Canadians may die. Listeriosis pales in comparison. Overall, it would seem that, as a country, Canada is far less prepared now for epidemics than in the past. We talk about the importance of protecting our rural heritage while creating safe and healthy urban environments -- cities in which people can walk or bike to work instead of driving their cars. Simple truth: We need a government that will ensure that the provinces, the cities, and our rural governments are able to create healthier, greener, communities where everyone has the same opportunity to thrive. We talk about how we want a government that looks out for the needs of farmers and that provide Canadians with accurate and reliable information about genetically modified foods, agri-business, and other issues that affect the food that shows up on their dinner table. Simple truth: The Conservative government defeated a bill designed to provide Canadians with full details about the genetically modified foods (the so-called frankenfoods) that are showing up on our grocery store shelves. We need a progressive government that will put the health and safety of Canadians first and the interests of big business second. We talk about how much we value freedom of speech, freedom of the press, and government transparency, and government accountability -- and how much we want politicians who are accessible, genuine, and trustworthy. We talk about how much we regret the treatment that aboriginal people in this country have received -- and how we want to move forward in ways that take serious action to right those wrongs. Simple truth: Destroying the Kelowna Accord, as the Harper government did, amounted to breaking a treaty between two nations. And aboriginal people in Canada continue to live with the fallout of historical wrongs that need to be addressed in a meaningful way. We talk about how much we value being part of a society in which everyone has equal opportunity to succeed -- including new Canadians -- and in which no one is discriminated against. Simple truth: The Harper Conservatives changed the mandate of Status of Women Canada to eliminate all activities that have to do with "political equality" or advocacy work. You only have to consider the number of women who make it Parliament Hill in this country to see that this cut was ill-informed (and, many say, extremely mean-spirited). The fallout is being felt by women's groups who do valuable work across this country. We talk about how proud we are of the Canadian Constitution and the Canadian Charter of Rights and Freedoms -- and a justice system that assumes innocence until a person is proven guilty. Simple truth: The Harper government chopped funding to the Court Challenges Program -- one of the only hopes "the little guy" in this country had of launching a Supreme Court challenge. Some of the key rights and freedoms that we enjoy in this country were defined by Supreme Court challenges. The Liberal Party has promised Canadians it will bring back the Court Challenges Program. We talk about the importance of giving young people the best possible start in life -- how the early years are the most important years: a critical time when we must invest in our children because they are our country's future. Simple truth: We need a government that is willing to invest in those early years by creating quality childcare spaces operated by not-for-profit operators rather than trying to mislead Canadians with a tax credit that shrinks down to very little once the tax man gets his hand on it. We talk about how much we value our children and our families, including our seniors. Simple truth: We need a government that will safeguard the health and financial well-being of seniors. Seniors are among the most vulnerable populations in times of epidemics and, as the Canadian Medical Association has warned, Canada is far less prepared for a global epidemic than it was before Stephen Harper came to power, as a result of incredibly ill-advised policy decisions in the area of Public Health. And then there was the broken promise about income trusts -- a breach of trust that took a huge bite out of the savings of ordinary Canadians -- including seniors. We talk about how proud we are about being Canadian and having a uniquely Canadian identity. Simple truth: At the heart of that unique and vibrant Canadian identity is a tradition of investing in the arts and culture sector in this country. The Conservative government has demonstrated that it doesn't value what artists contribute to the Canadian economy and that it would like to play Big Brother when it comes to deciding what types of material make for suitable entertainment for Canadians. We talk about how fortunately we are to live in a country like Canada that is one of the safest countries in the world. Simple truth: It's difficult to feel safe when there's so much we aren't being told about the safety of our food supply, our preparedness for a global pandemic, and who knows what else. It's the who knows what else that is the scariest part. We need a government that will be frank and open with Canadians and work with all levels of government -- provinces, cities, rural municipalities -- to ensure that no other Canadians are allowed to fall through the safety net that we Canadians both prize and take for granted. We don't want any more public health disasters under the watch of the Conservatives. We talk about how proud we feel when we travel abroad and people from other countries speak glowingly about Canada and its peacekeeping and environmental stewardship record abroad. Simple truth: Our international reputation has been badly damaged by the actions of this government. We're no longer seen as advocates for peace, justice, and the environment. We don't always step forward when the right thing needs to be done. Instead, we look over our shoulder to find out what the Americans are doing -- and then we adjust our position accordingly. Our independent voice in the world has been silenced and countries around the world are suffering as a result. What has happened to Canada? they ask. Many Canadians are asking themselves the same thing. we can't afford to vote for Stephen Harper in this election. When you vote, please vote for the kind of government that will create the Canada you want. And please urge other like-minded Canadians to get to the polls, too. People of Peterborough Riding are expressing strong opinions during this election -- many by writing Letters to the Editor of The Peterborough Examiner. Here are a few brief excerpts, just to give you a flavor of the issues being talked about in our riding. If you click on the link at the start of each letter, you can read the full text on The Peterborough Examiner website. MP Challenge: "MP Dean Del Mastro's comment that no one will "shove (the Little Lake project) down the community's throat" indicates that if a sufficient number of citizens express disapproval the plan will be scrapped. He should show his respect for our community by telling us exactly how he will measure public support for his plan. If he announces a shoreline referendum he will be a champion of democracy." Del Mastro promises misleading: "Dean Del Mastro made several grand promises in the weeks leading up to the election. One of these is to build a grand party palace on the banks of Little Lake, by what appears to be a specially selected developer.....Mr. Del Mastro is tellingly silent on the essentials. All we're really getting in this process is a bunch of inch-high headline promises that are likely not even worth the price of the newsprint they're printed on. Surely Peterborough voters won't be misled by this nonsense? Riding needs a fresh start: "Dean Del Mastro appears to be the most partisan politician in the history of Peterborough riding. He not only squanders our hard-earned tax dollars attacking other politicians...he divides our community by pretending that his opponents oppose his rail plan." Tories waging propaganda war: "The campaign for this election began two and a half years ago when Steven Harper took office. The barrage of attack ads that we have seen since goes beyond normal mud-slinging -it is propaganda, a focused program of persuasion and manipulation. The arguments typically appeal to emotions rather than reason. Never in the history of Canada has a standing government made such efforts to minimize their political opponents....Here in Peterborough, Dean Del Mastro has conducted a similar propaganda campaign. On a biweekly basis, Mr. Del Mastro has sent out "the pamphlets." What is interesting about these flyers is that they are little more than name calling with absolutely no details or substantiation. This is a classic propaganda technique. What kind of a representative would conduct such a campaign against his constituents?" The art of hypocrisy: "Imagine my surprise on reading Dean Del Mastro's description of this riding: after a brief mention of children playing hockey, he goes on to tout the richness of Peterborough's arts! ... I find Mr. Del Mastro's apparent pride in the local arts scene disturbing. I would ask him to please not use the arts like this, unless he is willing to confront Mr. Harper on his appalling stance. It only makes him look like a hypocrite. And I don't vote for hypocrites." Tory message holds: "The funny thing is, when I began looking online for information I didn't see where any cuts have been made, what I found was an increase in government spending....it was the cold hard facts presented to me by MP Dean Del Mastro that spoke the loudest. He explained how hundreds of thousands of dollars had made their way to Peterborough for projects like the Festival of Lights, Peterborough Folk Festival and the major refurbishment to the Market Hall." Arts funding fundamental: "Funding for the arts should be a no brainer. It would appear that it is Mr. Harper who is out of touch with ordinary folks and their cares." Tories will take us to dark age: "Think twice before you put an "X" beside the name of the local Harper lackie." Portrait's exposure was off: "Unjust characterization of candidates detracts from the real business of elections -making decisions based on facts." MP silent on pension cutback: "Dean Del Mastro would get my vote and I'd promote him far and wide if he would tell me why my old age security was reduced! But since he hasn't even had the courtesy to return any of my calls regarding this issue, this loss of income for me and likely others, I guess he loses my vote and the vote of friends etc. when I tell them how mean the Conservatives are." Too tight to cell tower location: "I write this letter sitting in my garden looking at a cell tower that was brought into our neighbourhood in April of this year. Not only did our MP Dean Del Mastro not respond to our appeals for help, the tower is now sitting on property owned by Mr. Del Mastro's mother, who is getting paid a monthly fee to host the tower. And although Mr. Del Mastro says he has nothing to do with this small piece of property that sits beside the Del Mastro car lot, he likes to park his cube van promoting the Peterborough rail line right beside the tower on this property he says he has nothing to do with. Talk about adding insult to injury....We need the help of our federal MP to get this cell tower removed. We invite all of the candidates to visit our community, hear our story and have a conversation with us on how to move forward on this very serious issue. Mr. Del Mastro's slogan is 'a safer, stronger, better Canada.' Well with the cell tower in my backyard on his mother's property, I know I am not safer. My neighbourhood is surely not stronger and folks, my neighbourhood is definitely not better! Train talk is premature: "....we did have a little problem recently in the south end, a cell phone tower on Del Mastro property on Lansdowne Street. We collected probably as many signatures opposing the tower as Mr. Del Mastro got in favour of the mythical railway. But we got no enraged outburst for our petition, not even an acknowledgement that we exist with a tower in our back yards. Mr. Del Mastro, get it down and you get our votes!" Better transit solutions than a train: "A Peterborough train would be nice, but the practical and affordable solution for improved transportation between Toronto and Peterborough is to get out a bucket of paint and give our buses a lane that will enable them to get in and out of the Big Smoke without getting stalled in traffic. HOV lanes aren't just greener, they are more financially responsible, because they make more efficient use of the transportation infrastructure we already have." Bus is the ticket: "Peterborough wake up. We don't need a MP pushing for the wealthy, we need someone who cares about the less fortunate and those struggling to make ends meet and our seniors. That's who will get my vote." Harper, Conservatives have abandoned environment: "Less than two years ago, it seemed that Canadians had finally woken up to the reality of climate change and were ready to support tough government action. However, looking at voting intentions in this election, it's clear we have slipped back into complacency.... Stephen Harper is hoping to convince us it can be business as usual and that now is not the time to bring in change. The subliminal message seems to be that the warnings of scientists don't really need to be heeded. The lack of a viable program on the part of the Conservatives is profoundly destructive. It sabotages any claims to environmental leadership that Canada may still have in the world and, on a more personal level, simply destroys hope in the future." Cost of growth is too great: "It is well past time for this community to recognize that there are and must be limits to growth if we are to survive. "Empty" land is generally either agricultural fields, which we are foolishly allowing to be covered with subdivisions, or wetlands crucial to flood control and waterfowl habitat, or forests, which supply oxygen we need to breathe. Shoreline is particularly critical as the cradle of aquatic life." Clear discussion of issues needed: "As citizens we must not value low taxes over services we need, especially for our children. We can't skimp on education and health services for them and then put our failures into expensive prisons and rehabs." Not so nice guy: "Does a leader have to bully you and lie to you for you to think him a fit leader?" Tory path to US: "A vote for the Conservative Party will result in a deterioration of Canada that we have not as yet experienced, similar to where the United States is today." Health care on death bed: "If voters search the Fraser Institute website they'll easily find an article titled 'Kill the Canada Health Act. '....Harper's Conservative cabinet is full of former Mike Harris ministers....Get ready to take out a mortgage to pay for major surgery. ....Our tax cutting Minister of Finance, Jim Flaherty, has taken too much out of the government revenue stream to allow us to weather the gathering economic storm and properly maintain important programs like health care. Voting Conservative will be a grave mistake for all Canadians who care about our universal health care system." Harper claims, Liberals do: "When Mr. Harper came to power Canada had a strong economy, a healthy government surplus, and we were paying down the debt. Now, the surpluses are gone so we can't afford as much debt reduction and the North American economy is a mess. And, lo and behold, the Conservative government has been outspending Paul Martin's Liberals, who Tories love to portray as tax and spend types"
World is in peril and Harper is shovelling quicksand: "This election has a fundamental theme that underlies all of the political rhetoric: individualism versus community values. The difference is huge: the global climate and worldwide poverty demand government intervention if our children's children are to survive. Instead, Stephen Harper's Conservatives ask us to choose lower taxes, appealing to our self-interest. They refuse to include the environmental and social costs of meeting individual needs. The remaining parties -Green, Liberal, NDP -understand that we have to maintain or raise taxes to combat the most serious environmental, economic and social threats ever to face the country." Non-vote is a vote for winner: "If you don't vote or if you spoil your ballot you have just voted for the party with the highest number of votes, no matter which party wins." Vote with my heart or with my head? : "This is a difficult election. For the first time in my life, I am an undecided voter. I have a Liberal sign on my lawn and an NDP sign and if the Greens call I'll take a Green sign too. 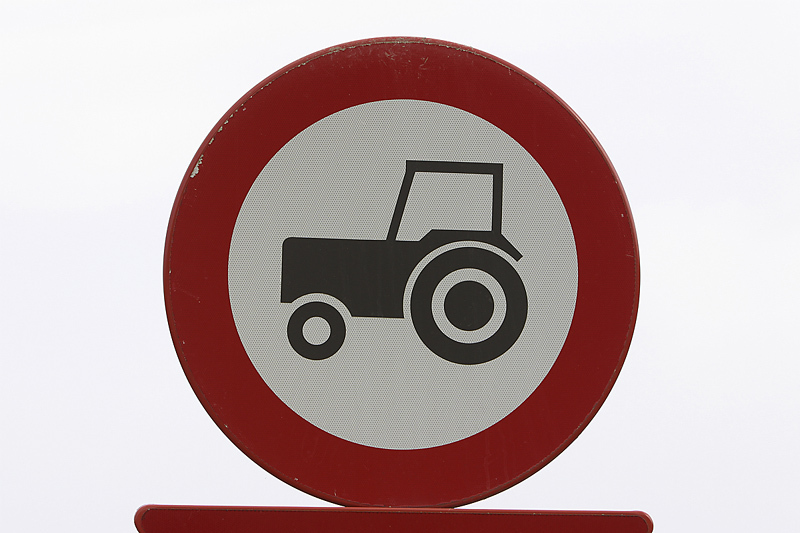 I'll draw the line at the blue sign or the Bloc, but that's as far as I can go." Vote for a better future: "If you care about the future of the country and our children and grandchildren please vote for a candidate who cares about the environment and the economy, which are closely linked issues." This list is my attempt to begin to spell out the disconnect behind what Canadians say they want and how they vote. 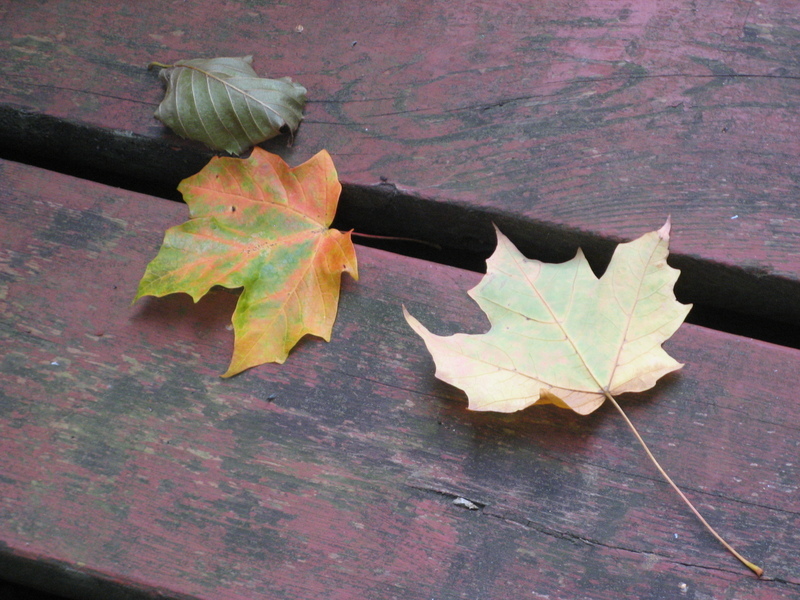 In this post, I create my version of a Great Canadian Wish List -- what Canadians talk about when they describe what's great about their country. In my next post, I'll measure this wish list against what voters are being offered by the Conservative Party of Canada -- the party that called this election seeking a mandate in the form of a majority government. What do we Canadians talk about when we express our values and talk about what we want for our country? 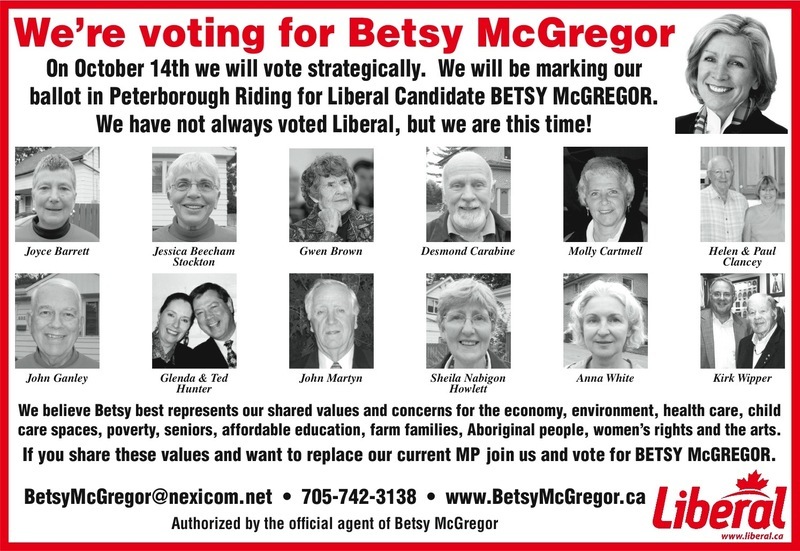 The following advertisement is running in The Peterborough Examiner in support of Betsy McGregor. Thinking About Voting for Dean Del Mastro? Make sure you have all the facts first. If you're thinking about voting for Dean Del Mastro because you think you have to vote for Dean in order to bring the train to Peterborough, you need to know that the Conservative, Green Liberal, and NDP candidates in our riding ALL strongly support bringing the train to Peterborough. You don't have to vote for Dean Del Mastro to vote for the train. You also need to know that the train is still a work-in-progress: that it still has to make its way through a process of approvals before it can be considered a done deal. Unfortunately, statements like this one from Dean Del Mastro's campaign literature make it difficult for people to understand that the train is not a done deal yet: "In Budget 2008, Dean celebrated the announcement of funding for the re-establishment of the Peterborough-Toronto Commuter Rail Link, claiming it to be, "The single biggest federal infrastructure investment in Peterborough since John A. MacDonald announced the completion of the Trent Severn Waterway." Dean may have celebrated the funding announcement, but he certainly hasn't been able to celebrate the approval of a train because that hasn't happened yet. "[Dean Del Mastro's] promise to return Toronto-to-Peterborough passenger rail service is looking more likely to come true, but is open to questions about whether it would be an economic drain. Last week's surprise proposal for a massive hotel-entertainment complex on Parks Canada property on Little Lake is exciting, but a long way from reality." Here's something else to consider. As columnist Lawrence Martin reports in today's Globe and Mail, the Federal Conservatives are doing everything they can to distance themselves from the economically disastrous policies of the neo-Conservative Bush administration south of the border -- a case it gets it gets more difficult to make after the politically disastrous speech plagiarism incident. The Harper government also reversed its position on the income trust issue -- a betrayal of the trust of many ordinary Canadians who paid heavily for this broken promise. Dean Del Mastro repeatedly reversed his position on this issue to support the party line. Where was he when his constituents needed him to speak out on this issue? And when public health objectives come into conflict with business objectives, Dean Del Mastro follows the party line by siding with big business. During the last session of Parliament, Dean Del Mastro voted against bills that would have provided more information to consumers about genetically modified foods and that would have provided more details warning labels on alcohol. If he wasn't voting in support of public safety and the public good, in whose interest was he voting? If you're thinking about voting for Dean Del Mastro because you believe that a revamped justice system under Stephen Harper will mean less crime, you might want to know that overall crime rates are on the decline and that the approach to dealing with youth crime that Stephen Harper and justice minister Rob Nicholson has been heavily criticized by the judge appointed to recommend changes to the Youth Criminal Justice Act. Oddly enough, Stephen Harper had been claiming throughout the campaign that the judge had endorsed the Conservative Party crime platform. If you're thinking about voting for Dean Del Mastro because you would like to see some sort of development occur on Little Lake, you might want to consider what you're getting for your vote. For starters, the parcel of land on Little Lake is under the control of Parks Canada. Parks Canada is mandated to protect that land for the protection of future generations. And, as our Member of Parliament, Dean Del Mastro is mandated to pursue the interests of all constituents. To ensure that the interests of all citizens of Peterborough are taken into account, consultations on a public asset as important as this one need to be conducted in an open and accountable manner. Anyone can put together a proposal and circulate it behind closed doors. It takes a true leader to ensure that the proper protocols are observed every step of the way and that even the perception of conflict of interest or impropriety is avoided. A true leader leads by example. If you're thinking about voting for Dean Del Mastro because you see him as being committed to the arts (his election brochure states that he has made numerous funding announcements with a focus on the Arts and Heritage community -- but his brochure neglects to mention that some of these groups are at risk of losing their funding as a result of his government's far-reaching cuts to the arts and cultural sector -- cuts he was privy to as a member of the Standing Committee on Canadian Heritage and the Standing Committee on Finance. Artists, arts volunteers, and arts patrons in our community recently met to discuss those cuts. Get the local response story here. Note: Dean Del Mastro has also been repeating the "we haven't been cutting funding" double-speak that tripped up Stephen Harper with the national media. Oops. If you're voting for Dean Del Mastro because you think he is serious about environmental change, you might want to consider that he served on the original Harper environment committee (the one headed up by Rona Ambrose; a committee that was so out of synch with what Canadians were demanding that there was a national outcry at the time). Unfortunately, all that really came of that outcry was a new committee chair: John Baird. During the Harper years, Canada stopped being known as an international advocate for environmental change and stated to be known as a country that lets the oil and gas industry and other business interests call the shots. Peterborough Examiner nature columnist Drew Monkman recently wrote a heartfelt Letter to the Editor on this issue. It's definitely worth reading. ....stood up in the House of Commons and stated how proud he was of the position the government had taken on income trusts. Whatever your reason may be for seeking political change -- a desire for change at the Federal level or here in Peterborough Riding -- according to election analysts (see links below), there is only one candidate who has the potential to defeat our Conservative Member of Parliament Dean Del Mastro on election night. 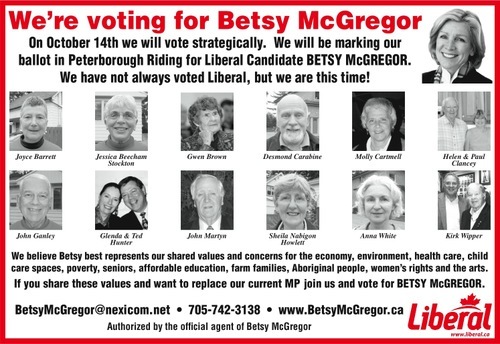 That candidate is Betsy McGregor, the federal Liberal Candidate for Peterborough Riding. Before we go any further, let me state that I think that any of the three progressive candidates running in Peterborough county would make an excellent Member of Parliament: Emily Berrigan (Green Party of Canada), Betsy McGregor (Liberal), or Steve Sharpe (NDP). The problem is that if we split the approximately 65% of the vote that will likely go to the three progressive parties in our riding, Dean Del Mastro will win because he will receive approximately 35% of the vote. It's a dilemma that Canadians across our country are grappling with at the riding level: how to prevent the very non-mainstream minority from holding on to control of our country and carrying out an agenda that is anti-progressive and (many of us would argue) anti-Canadian as well. (Read my reasons for launching this blog in December 2006 and you'll see that I've been deeply concerned about this government, our MP, and Canada for a very long time.) This is where strategic voting comes into play. The idea of strategic voting is certainly something alien for me, too. Or it was until I started listening in on the thoughtful discussions of everyday Canadians like you and me and hearing how passionate they were about preventing a Conservative majority government -- and of allowing themselves to dream of a time when we might actually have a progressive government in power in Canada again. Uniting the left is the only way to begin the process of unseating the Harper government. By going after the Conservatives in those ridings where they are most vulnerable -- in ridings like Peterborough where the race is going to be close -- we have a chance to end up with one more progressive voice on Parliament Hill. That person will not be a voice for any one party. That person will be a voice for all people in our riding who hope for a more progressive future for this riding. "What separates us from the Conservatives is that we believe you can’t have an efficient economy without a just society. "A just society — where every citizen is equal; where we succeed together, because we look after each other; where no Canadian goes to the wall when times are tough; where no Canadian has to walk the lonely road of poverty or ill health alone. The Green, Liberal and New Democratic parties should prevent vote-splitting that would favour Conservatives, and carve up electoral ridings according to who has the best chance of winning, May said. "We sit down and say, `Who has the best chance of winning in all these ridings?' What I've been calling for is proportional representation by other means." Here are some resources you may wish to consult as you begin to consider whether voting strategically is the right move for you. I will continue to add to this list during the days ahead. You may also wish to use the voting tool in the upper-right hand corner of this blog. It tells you which candidate is considered Peterborough Riding's best bet for electing a progressive candidate. Note: The tool is updated on a continuous basis as polling data changes. Find out what else Dean Del Mastro voted for and against by checking out his voting record.